In the summer of 1970 I met a man named Oliver Butterworth. As school was off, I was just sort of hanging around the stores at the center of town. Butterworth, a quasi famous children’s author was campaigning on the street for Joe Duffey, a very liberal anti-war Democrat who was running against Lowell Weicker for one of Connecticut’s Senate seats. It was during Vietnam and Oliver was handing out Duffey buttons and peace movement leaflets out of a VW Minivan. He had rigged a makeshift awning and had a card table with lemonade. He was like a character out of “Alice’s Restaurant.” Kind of an old Hippie. As I was just hanging around with nothing to do, (I realized later, he worked as a local teacher and was just hanging out during the summer too) he invited me to hand out buttons and leaflets. He explained the anti war movement and how much was at stake in the coming election, and how it’s up to the people to change things. I have a picture somewhere of me standing in front of that van with Duffey for Senate buttons all over my shirt trying to look informed and ready to fight for the people. I wasn’t informed or ready to fight. I was eleven, but I had a cause. 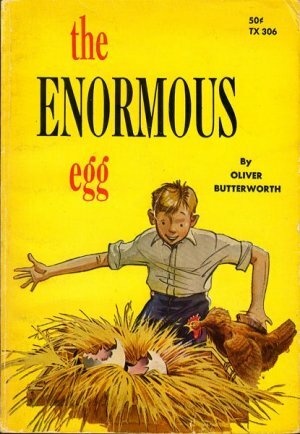 Butterworth had written a children’s book named ‘The Enormous Egg.’ It was about a New Hampshire farm kid (Nate) whose chicken predictably lays an enormous egg. When the egg hatches, not a chicken emerges, but a Triceratops whom Timmy names Uncle Beazley. 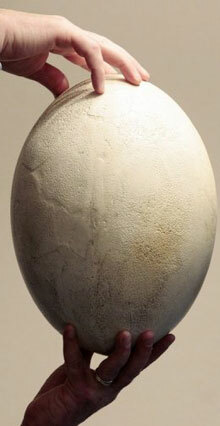 As soon as this is discovered, all who had been laughing at the kid with the enormous egg develop their own agendas. As the dinosaur grows amid media hoopla and opportunists trying to profit on the find, they need to ship Uncle Beazley off to the National Zoo in Washington DC, because he’s basically eating the farm. Eventually, Congress, appalled at how much the Dinosaur is eating at the Zoo decides to declare it Un-American (Oliver wrote it in 1956 and was trying to turn 8 year olds everywhere against McCarthy.) Timmy goes on TV and rallies the masses to petition Congress to “do the will of the people” and accept Uncle Beazley as a permanent resident at the Zoo. They all live happily ever after. During that summer and fall, Oliver would tell me where he was going to park the van and I would show up there, hand out stuff and get a civics lesson. Did my Mom know I was out meeting an old guy with a van? Yes, and she didn’t think anything of it. It was a different time and we didn’t assume everyone was out to molest us. I’m sure she thought “well, it’s not like he’s a Catholic Priest or anything, so what the hell.” Oliver only molested me with anti-war rhetoric and a far left liberalism (in retrospect socialism) that I think I still retain today. Actually, he was pretty cool. At the end of it all, Joe Duffey lost the election by 90,000 votes. Lowell Weicker went on to become the moderate Republican that swayed everyone against Nixon and forced his resignation. In the end, it pretty much worked out the way Oliver wanted it to. Oliver wasn’t a big Nixon fan. After the election was lost, Oliver called me and told me we had stood for what we believed in and in taking a stand there are no regrets. Not long after, he mailed me an autographed copy of the Enormous Egg which I still have. Hollywood offers up many fights, competing agendas and deception so thick, Nixon would be proud. Honor sometimes can be scarce. The higher the stakes, the more ruthless people become. Perhaps it’s just human nature. I’m not complaining mind you. By and large I find it fascinating, and those around me find my righteous indignation in the face of it a constant form of entertainment. What I find myself fighting sometimes is the regret. If I had only done this, or if only I had done that I would have gotten the result I wanted. I always try to do the right thing and believe it or not, doing the right thing around here sometimes gets you screwed. I have a nasty habit of obsessing about that stuff long after the fight has ended. I’m learning to let go. For 2012 my main resolution is: WWOD (what would Oliver do.) He had fought the good fight, done what he could, mentored where he could, spoke his truth in public, moved on from each fight with no regrets at the outcome. He trusted that goodness would prevail, which it eventually does in one way or the other, and that setbacks are temporary. It’s a funny thought. What WOULD Oliver do in Hollywood? I guess I’m going to find out. Stay tuned. Posted in What Would Oliver Do?